Rotary Club of Abbotsford President Stacey Irwin welcomed District Governor Lindagene Coyle to the club’s meeting. District Governor Coyle’s concise but inspirational message focused on the strategic goals of Rotary and District 5050 which included: service to community; club collaboration; membership renewal and engagement, and the power of Rotary to make a difference. “Think of your involvement in Rotary and donations made to the Rotary Foundation as investing in a better world.” This was the District Governor’s salient challenge to a room filled with Rotarians, community partners, business leaders, and friends of Rotary. 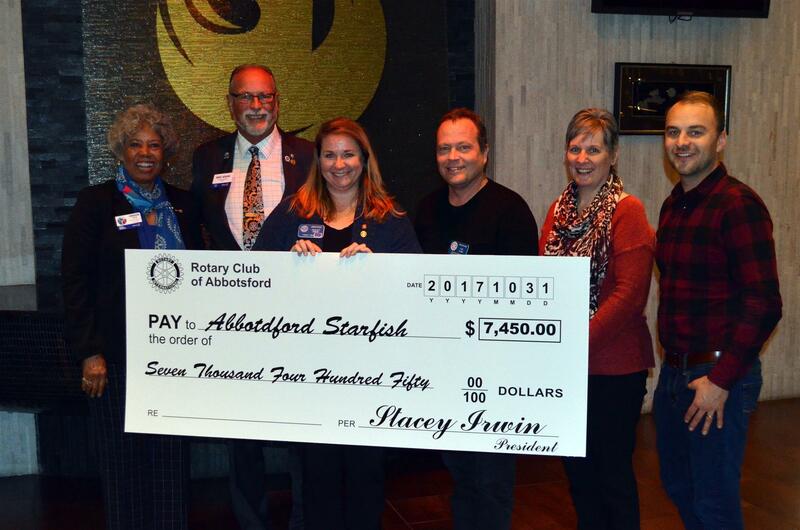 Following this two cheque presentations were made to the Abbotsford Food Bank for the Abbotsford Starfish Pack Program. Photo 2 (L-R): Ron Kelly – Partner of Baker Newby Lawyers, Neil Stark, and Rod Santiago of Abbotsford Community Services representing the Abbotsford Food Bank – Starfish Pack Program.